In case you don’t yet know, ~ghee~ is having an Autumn Leaves hunt! I’ve tried on all the pieces and they are rich with the beautiful colors of Fall and perfect for a day out shopping, meeting friends for coffee or a romantic afternoon with your sweetheart. I’m wearing the Oatmeal Coat, Pumpkin Thermals top and leggings and Oatmeal boots. You’ll find more details below my photo! The ghee Autumn Leaves Hunt is underway! The ghee gals have created an amazing Autumn Leaves Collection and have turned it into a hunt. This hunt contains 27 co-ordinating pieces that you can layer, mix and match in so many ways! All you have to do is look for the 27 Golden Leaves that are 10L each and the whole collection is yours! This fantastic hunt will end on November 30th, 2014. I was born and raised in New England, I love lobster, chowder, the beauty of the changing seasons and the small towns of coastal Maine. My residence of the past four years is in a city situated in the northwest corner of South Carolina. Not only am I terribly homesick for the coast of Maine…I am also very much missing the snow. As I sit by the open window, with the temperature nearly 70, all I can think about is taking a lovely walk in the evening; with snow softly falling around me. Come September, I shall be moving even further from my beloved Maine. My husband and I will be traveling back to Tennessee; to be closer to our family. So, for now, my longing to take a walk through the snow at twilight is only a click away…on the many beautifully landscaped sims of SL. Tonight, I strolled around the gorgeous sims of Winterfell. An enchanting place to wander and enjoy quiet reflection. I leave you with the words of the inimitable Robert Frost. Shot on location at Winterfell, Anodyne using LumiPro V3.2 and edited using PicMonkey (Royal Pack Edition). 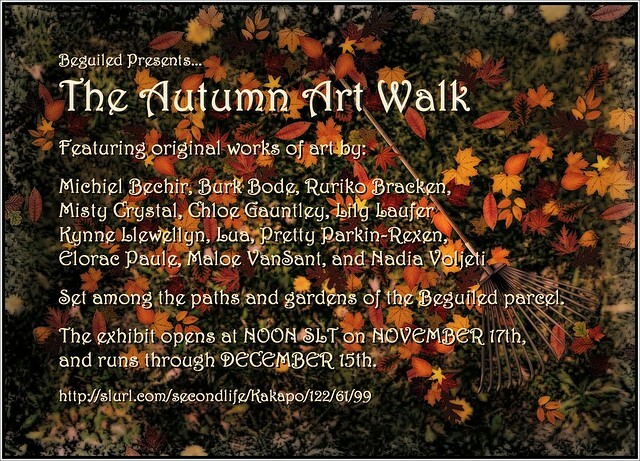 The opening, yesterday, of the Autumn Art Walk at Beguiled Art Gallery and Studio was very well attended. Those who joined us gave praise to the amazing pieces of art; set amongst the lush landscape. We have very special and exclusive fashion events planned for the first and second weekends in December. Stay posted for more information to come in the next few weeks. Meanwhile, take a leisurely stroll through the Monet-like setting at The Beguiled and enjoy the latest visual creations from some of SL’s most gifted artists. *If you are a photographer, fashion blogger or just someone who likes to take pics…you can take advantage of the many wonderful props, scenes, scenery, photo studio and natural landscape at The Beguiled. You can also rez your own props there…in turn, we respectfully request that you take your things with you when you are finished.